If you want to make your furniture last, please read this entire section. It's worth it. It's great that you have purchased, or are considering the purchase of leather furniture. Leather is a wonderful material choice for those of us with active lifestyles. It is usually selected because it is a comfortable and luxurious material, but also because it is so simple to clean and maintain. Having quality furniture is an investment into a quality way of life in your home. Regular and proper care, combined with regular and proper maintenance, is very important to make sure your investment lasts. One basic understanding of properly caring for your furniture is that unless it is fitted with casters, it should never be slid or dragged to move it. Doing so can damage the legs or frame of your furniture, as well as can damage your flooring. Never drag or attempt to lift your furniture from an armrest or any area other than the bottom base. Quality furniture has some measure of weight to it. Lifting an item from any area other than the bottom base may cause damage. Felt pads or rubberized feet are recommended if your furniture is going to rest on any surface other than carpet. Any furniture with moving parts should always be operated with care. Standing on any piece of furniture is not safe and can cause damage or result in injury. Recliners should always be kept with seats and backs in their fully closed and upright position when not in use. Never allow children to play on or near mechanised furniture or operate mechanisms. An ounce of prevention is worth a pound of cure. For those of us who love our pets and allow them onto our furniture, it is necessary to place some sort of protection over the furniture in the areas your pet likes to jump up on and lay down at. A large folded fleece blanket seems to be a popular solution utilized by most customers. If you keep your pet indoors while you are away, it is a good idea to cover your entire seat areas with blankets. Pets like to rest in many different areas. And should a pet have an accident on your furniture, it is much easier to clean or dispose of a blanket than having to deal with damage of any kind to your furniture. Regular fluffing and smoothing of cushions is an important procedure to keep your furniture in good condition. Regular fluffing and smoothing helps to ensure more even wear. Cushions not attached to the frame should be rotated regularly. Keep your furniture away from sources of heat and cold, and avoid prolonged exposure to direct sunlight. Prolonged exposure to direct sunlight will cause damage and fading of all types of coverings. There is absolutely no such thing as a fade proof leather or fabric, and there is no warranty against fading of any leather or fabric. Exposure to sources of heat as well as prolonged exposure to sunlight has a drying effect that can break down materials and finishes. Exposure to sources of cold or dampness can cause mold growth. And no one likes to live with a fungusamongus. Blue denim...is the arch enemy of furniture. This is a long winded section. But it deals with one of the worst case scenarios involving accidental damage to furniture. In particular, new blue denim jeans are the frequent culprit. We have lost showroom samples in the past because a customer came through our store wearing brand new blue denim jeans and sat on our display pieces. The dye in new jeans is a notorious wrecking ball for any fabric or leather furniture, unless the color you selected for your furniture was blue or black to begin with. And don't be fooled. Any new denim can transfer the dye color onto other surfaces. Unfortunately for us, most new jeans have not gone through the wash and dry cycles enough to remove any excess dye that's in the denim material. And furniture is not the only thing in your home that's vulnerable to the perils of new denim. If a friend or family member sits on your carpet with a pair of new denim jeans, there are good odds the dye will get onto the carpet as well. So, unless you selected blue or black as the color for your furniture or carpeting, if someone comes over wearing new denim jeans...tell them you just decided to take them out for coffee...and that you'll treat!! And be sure to drive to the coffee shop in their car!! If it's company coming over for a dinner party, then leave a fleece blanket on your furniture. As previously mentioned, we have lost a few showroom display pieces to blue denim. We have also saved a few. In the instances where we saved a few, we were fortunate to see the problem early on, before the dye had a chance to set. You have one of two options to choose if you find yourself in this situation. First option is to do nothing and convince yourself that what just happened to your furniture added to the "patina" of a day in the life of a sofa. Second option is to immediately call Guardsman at 800.516.0195, and ask them to walk you through suggestions on what to do; perhaps even schedule an appointment to have a leather technician come to your home to see if or what repairs can be done. The next step to making your leather furniture last is a two step process. The first step is to clean high traffic areas, specifically the arms and head rest areas. You should clean and condition these areas a minimum of every two to three months. Begin by wiping down the areas with a clean and damp soft cloth. 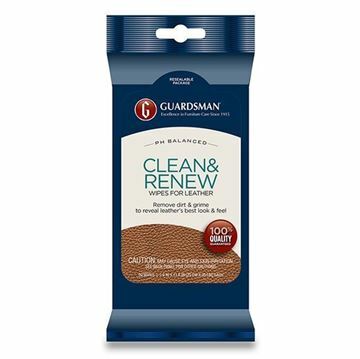 Next, wipe down the areas with Guardsman Leather Clean and Renew towlette. Take notice to the soiling that is coming off the leather. You should continue cleaning, using a new Clean and Renew towlette as necessary, until almost no soiling is coming off any more. At this point, you have deep cleaned the area and removed natural body oils that your daily use has transferred onto your leather furniture. After the cleaning process is finished, wipe the areas down with a clean dry soft cloth. And complete the process by wiping the areas with Guardsman Protect and Preserve Towelettes. When complete, you have effectively cleaned and hydrated your fine leather furniture. The final process to making sure you get the longest life out of your leather furniture is to wipe down the entire piece of furniture with cleaner and conditioner every four to six months, or as needed depending on your amount of use, and the environment you are in. If you use the piece of furniture heavily, or if you are in an environment with low humidity, you should clean and condition your leather furniture every three to four months.